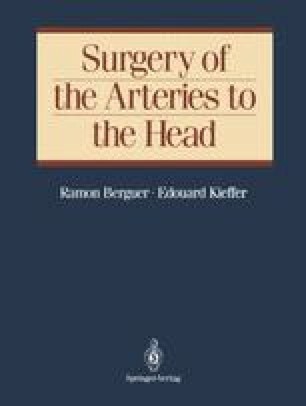 Two mechanisms are involved in the production of symptoms in patients with lesions of the arteries that supply the brain: (1) The hemodynamic mechanism implies a regional drop in blood flow that is the result of either a restriction imposed by a proximal arterial blockage or failure of the heart pump mechanism to generate an adequate head of pressure (hypotension, arrhythmia). (2) The embolic mechanism is one in which particulate material—originating in the wall of the heart or of an artery—is carried by the flow stream eventually to lodge distally in some smaller vessel. This sequence usually results in occlusion of the vessel involved and damage to the tissue dependent on it if collateral flow cannot compensate for the arrest of blood flow. Some emboli may lodge in vessels but do not completely obliterate them, i.e., cholesterol crystals or emboli of irregular contour caught in a bifurcation. Other emboli fragment after lodging in a bifurcation and reembolize distally, as seen with fibrin-platelet plugs in the retinal arteries.